I'm so tired today. I'm just sitting here, staring into my Mac and can't seem to find anything significant to write. I have spent a week tidying up my entire home, down to the tiniest bits. It was quite a process - a process that had an influence on my emotions as well as on my physique. But although my lumbar area is aching, my scalp muscles are tense and my arms are sore as if I’ve been weight training with a Russian Olympic weightlifter, I feel happy and really relieved. All my old bits, pieces and memories from both good and bad times have been up for sorting and scrutinizing and sent either to the tip along with a “thanks for everything” or honoured with a new place in my home. My flat has been released of fifteen 100-litres rubbish bags of textiles, books, papers, wires, electric thingies, photos and things and stuff. A new joy over my home and my stuff overwhelms me. And I have noticed that I treat my things differently. I don’t throw my clothes anymore. I fold it nicely when I’ve used it – even the bits I put in the laundry basket. I'm sitting here on my settee looking over my home only surrounded by things I like. It does something to me. For some reason I was attracted to this project, perhaps because I recognized that I'm repeating patterns that annoy me. I have a habit of buying stuff that is "good-enough" and rarely treat myself the best. I've inherent a basic poor man's mind-set regarding scarcity and shortage from my parents, which typically manifests when I’m in a shopping situation where I can choose between what I like the best, but is also pricy and what is almost as good, and costs less - I'll almost always go for the second best and that leaves me displeased every time. So of course my home and my possessions reflected that mediocrity and "one never knows mentality" that I actually despise. There was also another thing that might have attracted me. I hate tidying up, but love order. I find tidying up so much a waste of time. It really bores me, and order is always such a short-term pleasure I think, until you have to do it again. So if I could arrange my home in a way so I could avoid that in the future, without having to pay a personal assistant for it – I would be all up for it. And I think that the Konmari Method delivers that. The order I have obtained now is easy to keep and provides a nice calm atmosphere. I can really recommend the Konmari Method if you yearn for lasting order and a happy home. The Konmari method was invented by Marie Kondo a Japanese woman, who has had tidying as passion all her life (bless her), and she has written the bestseller: The Life-changing Magic of Tidying. Her idea is that you only have to tidy up properly once, and from then on you only need to maintain. 1. Sort by category, not by location. Tidy up per room and you will never be done, and either will it ever bring you to the core of your messy problem. However. When you tidy up and discard by category, it's astonishingly how easy and fast it goes. 2. Sort items by whether they deliver a spark of joy. If they don’t, they should be removed from your home. If you follow that principle, you will end up surrounded only by things that you really like - and that’s life changing, I dare say. 3. Arrange your things manageable and with simplicity. Everything – and I mean EVERYTHING - must have a designated place, and you will have to arranged all your stuff in a practical and manageable way, so nothing can be mislaid, which I can promise you, involves a rethinking of your way of folding textiles. Marie Kondo knows very well that most people find it difficult to let go of things, so she stresses that it's important to start with your textiles, because there are not that many emotions attached to clothes. You kind of use the clothing phase to get in shape, to strengthen your decision-making ability and to get into the right level-headed mind-set. After that you are ready to take a calm look at your books and magazines. And once you've gone through the first two categories, you're prepared to ease yourself off from old manuals, lecture materials, vouchers, bank papers, notes, recipes, fridge notes, etc. From there you move to the Komono category (various small items), which consists of all the little things and gizmos, such as CD’s, wires, cables, keys, kitchen items, coins, bathroom things, jewellery, makeup, etc. When you’ve been through the first four categories you can deal with sentimental items. This category includes photos and personal letters. My journey through the five categories gave me progressively a more realistic approach to my stuff, and I felt a deep joy afterwards left with only quality over quantity. I have always perceived myself as the neat type in a tyrannical manner, and have very often with dismay brought my son's messiness to his attention… However. "When we have a strong negative reaction to someone, they are likely reflecting traits that we also possess, but have been unwilling to embrace." Claims my good old guru Deepak Chopra. Well, that reflection was quite in my face all of a sudden. "Hi, my name is Hanne. I'm messy. "Group response: "Hiiiii Hanne!" But I had Marie Kondo to sort that out for me through her three tidying steps. And I started as suggested with my clothes. Before I started the project, I took a moment and visualized my goal - how I wanted the end result to be. This exercise made me think of my basic values and how they very often discord with the things I acquire. I like solid quality, simplicity and good design. I have an expensive taste, but my wardrobe definitely did not reflect that. Hence I decided to be 100 percent true to my taste and to keep that in mind throughout the process. And with that mind-set I dug in. Every piece of clothing needs to come into lights, also the stuff hidden in basements and attics. The Konmari method does not work with hiding season clothing. Storing off-season clothes is cumbersome are no longer relevant as our homes now are well ventilated and tempered throughout the year. Moreover. “Clothes that have been stored away for a long time look wilted, as if they have been stifled.” Says Marie Kondo. But don’t worry, there'll most probably be plenty of room for everything in the wardrobe once you've sorted, discarded and reorganized. Note that the clothing category also includes shoes, belts and bags. I started by completely emptying my closets and put everything on the floor. There also turned out to be stuff in the cupboards that had nothing to do with clothes, I put that aside for later sorting categories. Then I checked every other closet and drawer in the rest of the apartment for hidden and forgotten items in the clothes category. I Then took each piece of clothing in my hand - one by one, looked at it - new or old – with the same dispassionate gaze, and noticed if it gave me a spark of joy. It may sound like a lengthy process, but the visualization exercise beforehand where I’d identified what's important to me, provided me with quite a confidence in this decision making. And I accelerated quite fast too. The whole clothes process took me one day. All Inclusive. Whenever in doubt whether a piece of clothes should stay or go, I asked myself if it was because I was stuck in something from the past or if I was worried about the future, and then the decision was easy to make. I realized that the past and the memories would always be there, even if you shed the shamelessly washed-out concert T-shirt from 1989 – which by the way hasn’t been used since. When things no longer deliver a spark of joy, you should get rid of them, says Marie Kondo. Instead of being guided by an attachment to the past or a desire for stability in the future, you can instead ask yourself, how you want to your life. Thus, all that didn’t give me a spark of joy was sent to the recycling centre with a small "thanks for everything". The rest was reorganized. The sorting resulted in an urge to do everything properly too, so I also washed the closets and a lot of the clothes before I putting it in place. The Konmari method recommends that you place as few things as possible on hangers, because clothes take up much more space when it is hanged than when it‘s folded. So if you typically have had your pants and jerseys on hangers, you can now give it new life in a drawer or on a shelf instead. The standard is this: hang jackets, coats, suits, skirts and dresses on hangers as well as clothes made of soft materials that flares easily in the wind. Drawers are by far the very best way to create an overview and keep closets tidy. If you lack drawers, you can use boxes instead - just keep lids off them, because lids have the habit of attracting things on top them. When things are piled on top of one another, like when you stack your jerseys, folded as they do in the stores, the jerseys in the pile virtually disappear and we rarely use them, but when want to, we easily mess up the nice piled order. That's why you should arrange your clothes (and other things) horizontal wherever possible. When you adhere to the horizontal principles, you’ll find that you in one glance can see almost everything in a closet. In this way you get an overview, it's simple to pull out what you want to use without disturbing the order, and it's easy to put stuff back in place. The horizontal order principle demands that you fold in such a way that the clothes can stand up by themselves, which requires a few more folds than usual. Bonus effect: This way of folding and arranging gives the clothes fewer creases and wrinkles, making it appear almost ironed in the drawer, you can check out this phenomenon in my videos on how to fold duvet cover, jeans and T-shirts. Think about where the piece of clothing is to be stored. If it’s in a drawer, the end height of the clothes should be slightly higher than the drawer height. Fold clothes into a rectangle. Then fold the short ends of the rectangle towards each other until there is a suitable "soft spot" between the two sides. If one end of a piece of cloth is thicker than the other, it may be helpful to fold the light end one more time than the thick end. Every piece of clothing has its own spot where the folding feels just right. It is all about finding that. Put the ends over each other, so that the clothing when standing forms a triangle. Goal: If the clothing can stand by itself, if it’s folded correctly. Lay the socks on top of each other - toes on toes. Fold 2-4 times, depending on the length. Fold from the toe ends toward the waistband. Waistband is to be on the outside when finished. When you fold socks in this way they take up less space and allows you to see how many socks you have at a single glance. Try drawing an arrow that goes from left to right in upward direction 📈. Then draw another one descending to the right 📉. Which of the two directions seems most comfortable? For most, upward curves have a positive effect and make things look easier. This principle can be transferred to home deco too, thus making things happier. Arrange your clothes so that they rise to the right. This is done by placing the heavy items on the left side, and the light items to the right. Heavy fabrics include the long stuff. As you move toward the right side of the closet, the length of the clothing grows shorter, the material thinner, and the colour lighter. 1. The best way to store bags is in another bag. Bags that are not in use are great storing space. The rule of thumb is that you can store up to two bags in one. The key is to pair the same type of bags, for example handbags made of the similar material. Let a strap or a zipper in plain view – so you don’t forget about the hidden bag. Park shoes with the toes pointing outwards for harmonious impression and overview. 3. Decorate your closet with your secret delights. Most people have things that we care about, but would rather other people didn’t know about us. Items like posters of old pop idols, or hobby related or self-help books or anything that we hide away from the public. But it's a shame, Marie Kondo thinks. What you like should not be hidden away. Instead, you can transform a closet into your own private space, which at the same time give you a thrill of joy and pleasure. You can use these treasures to decorate behind your clothes or inside of the closet door. You can decorate with anything - posters, ornaments whatever you like. Your storage space is your private paradise, so personalize it to the fullest. Things purchased, but not yet in use, and therefore still in packaging, can really make closets and drawer look untidy, and make it difficult to keep order and it take up more space that way. In addition, it is often a symptom that you have far more stock than you need. I myself have really taken this principle into use on many levels. I had some unpacked nylon stockings in the wardrobe, they are all "freed" now, and I’ve done the same with cleaning items and even dishwasher tabs. No ugly boxes and bags here anymore, and it looks so much nicer and calmer now - even under the kitchen sink. How my books got a new and better life. Papers and documents – discard everything. Bits and pieces and kitchen and bathroom stuff. 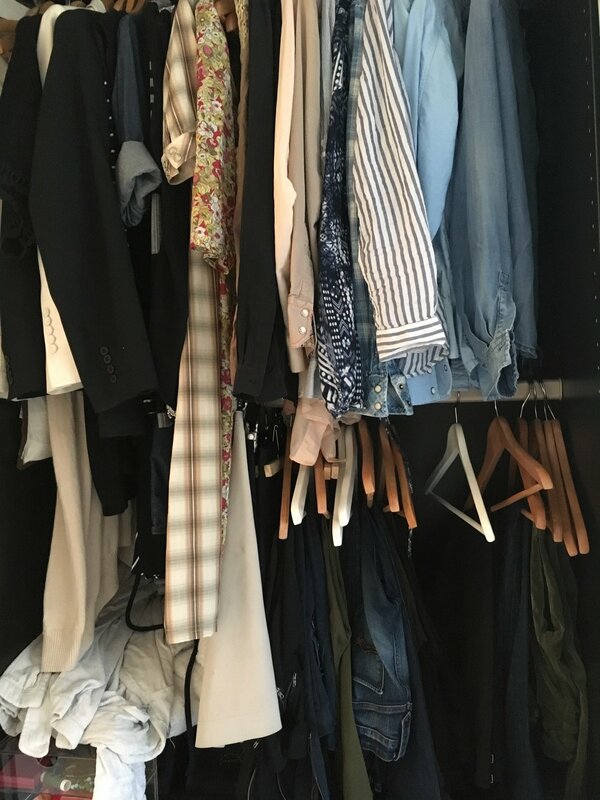 The Konmari Way - Part 2.